AfterBurner-4 builds on the highly successful award-winning AfterBurner 1&2 range of evidential video surveillance recorders. Retaining the same footprint for ease of replacement, new features include 4 independent standard definition inputs along with one full-HD input (up to 1080p/30). The front panel user interface is based on the previous models, so little extra training is required for user operation. 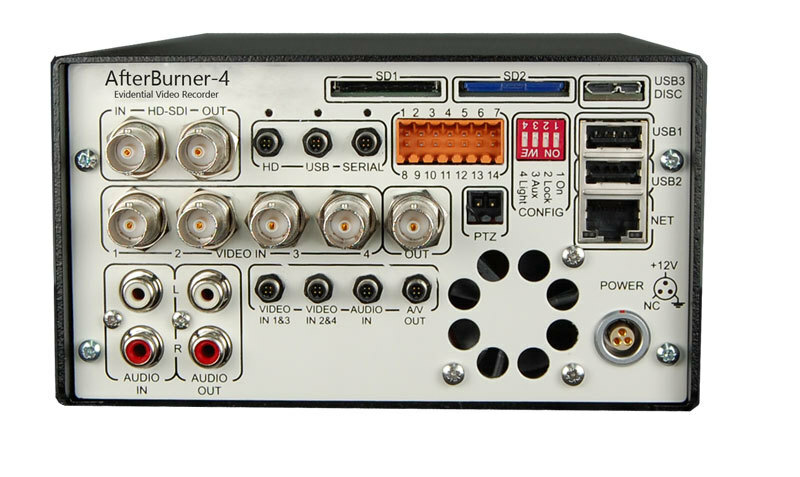 AfterBurner-4 utilises efficient H.264 video compression providing high quality images coupled with long record times. The record times can be extended further by using time-lapse modes, or by selective recording using internal video motion detection, timers etc. Evidence is burnt to write-once DVD or Blu-ray discs or optionally to a removable SSD drive for rapid retrieval. All files may be SHA256 hash coded by AfterBurner-4 to provide an evidential audit trail. Networking has been enhanced to allow for remote control and live monitoring via its Ethernet and WiFi* interfaces. The unit has an easy to use web-page interface for control and setup, along with the ability to live stream in RTSP format to video management systems such as Genetech and Milestone. Ovation Systems also provide free server software to make the connection to remote devices from unknown IP address quick, secure and easy. Operating temperature range: 0 to +40 °C (with removable solid state disk -20 to +65 C). Mechanical Size 155 x 90 x 260 mm (as previous AfterBurner). Standard accessories: Mains PSU, user guide, power lead. Operating voltage range: 10 to 14 V DC. Typical power consumption: Sleep 3mA, recording 650mA, burning 2A. Short-term power segues up to 4A. Drives supported: DVD / Blu-ray optical drive or or 1 x removable SATA SSD 2.5" drive. Max DVD burn rate: >x6 (typically 15 minutes, or less). Internal hard disk drive 500 GB. Power-up record time: ~ 30 seconds. External camera power: 5V, 9V or 12V (700mA total max). Record control by -Local start / stop button. -2 external control inputs activated by contact to ground. -Mechanical shake detection (internal accelerometer). Record pre-trigger Fixed at 2 seconds. Video inputs: 4 x PAL / NTSC, 1 x HDSDI. Video I/O connectors: 4 x BNC inputs, 1 x SD BNC output. 2 x BNC (HDSDI in /out). Video compression: H.264 recorded as .FLV files. Digital sampling resolution: PAL:720 pixels by 576 lines. NTSC: 720 pixels by 480 lines. Video quality adjustment: 5 levels. A/V Video out SD (PAL or NTSC) monitor of video input with onscreen display. HD inputs are down-sampled to SD. Monitor of audio inputs after mic gain, ACG etc. Audio I/O connectors: 2 x RCA Phono, 1 x i-Conex. Ethernet interface: Static and DHCP addressing. Web page control and configuration. Streaming: H.264 RTSP streaming of video with configurable, resolution, frame and bit rates. AAC or G.703 audio streaming. WiFi*: External USB b/g/n internal WiFi interface. Access point and client modes supported (future upgrade). RS232 port modes: GPS; decodes NMEA data. Log of data to disk & shows coordinates on screen. PTZ control (RS2323/ 422) with Visca and Pelco-D protocols. 2 x SD card slot For firmware upgrades. Security features: - SHA256 hash coding of files. - Internal IPSec VPN (future upgrade). Evidential video & audio recorder for police surveillance operations. 4 x SD or 1 x HD video inputs. 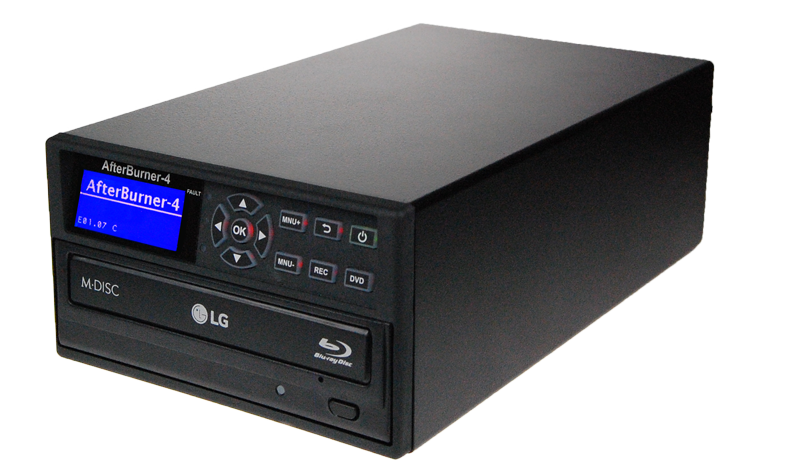 Records to Blu-ray/DVD optical disc or optional removable SATA SSD drive. RTSP streaming to video management systems such as Milestone, Genetech, Crossfire etc. Easy upgrade from AfterBurner 1 & 2: same footprint and similar operation to the original AfterBurners.